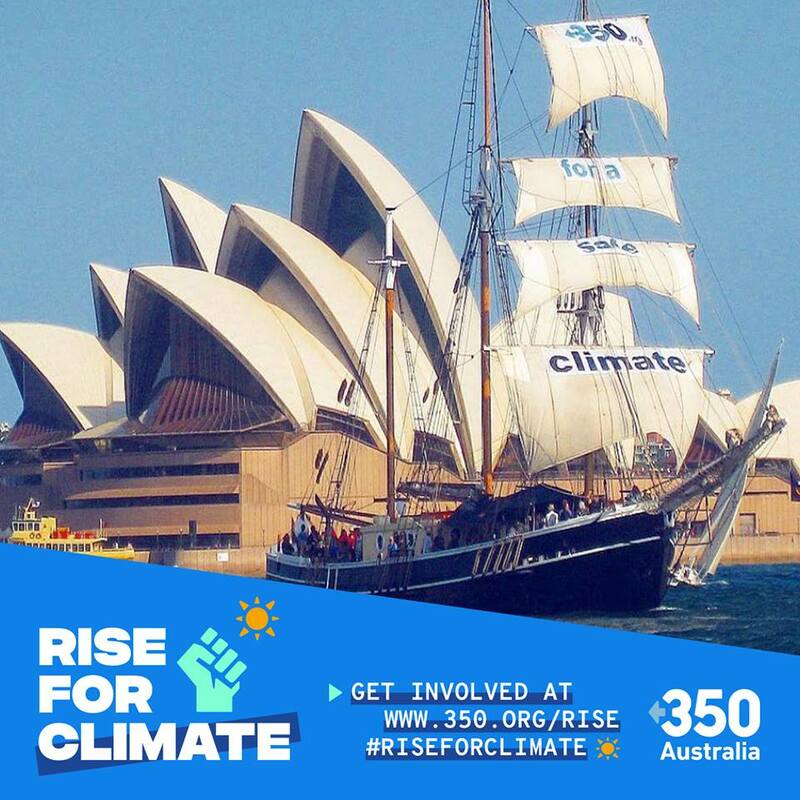 BOOKED OUT #RiseForClimate: Sail through Sydney Harbour! Find other #RiseForClimate events near you by searching for 'Sydney' on the map at www.350.org/rise. 350 for a safe climate future. The number 350 means climate safety: to preserve a liveable planet, scientists tell us we must reduce the amount of CO2 in the atmosphere to below 350 parts per million. In 2018 – almost ten years later – the global concentration of carbon dioxide in the atmosphere has reached 400 ppm for the first time in recorded history. Over that same period of time, we have seen the Australian federal government fail time and time again to take real climate action to preserve a livable planet for future generations. On September 8, 350 Australia is going back to where it all began. We will be sailing through Sydney Harbour with a new message: that it’s time to #RiseForClimate. This will be an eye-catching event unlike any other action – and we want you to be a part of it. Book now and you will be part of our unique flagship event on a massive global day of action. Rise for Climate on September 8 will see thousands of rallies in cities and towns around the world, demanding our local leaders commit to building a fossil free world that puts people and justice before profits. Join us as we sail around Sydney Harbour – making sure that everyone walking through Sydney’s tourist hot spots on September 8 sees our timely call for climate action. Refreshments: Light food will be provided and drinks are available for purchase on board the ship. You must register your spot on board through Eventbrite and we’ll send you all the details. Let’s set sail and #RiseForClimate.